Hieroglyphic writing was first started around 5000 years ago.In 400 A.D, Egyptian wrote in hieroglyphs, hieroglyphs are words pictures, and there are more than 2000 hieroglyphic characters.(“Hieroglyphic”). According to an ancient Egyptian belief, the god Thoth had given them knowledge of hieroglyphs so they named it “divine intelligence.” The Greek visitors on seeing these word pictures on the tomb and temple walls called it as a hieroglyph that means “sacred carving.” There were more than 700 hieroglyphic signs that were taken by observing images e.g. building, birds, people, flowers, and animals. According to Brunner the prehistoric Hittites, Mayans, and Cretans used very different hieroglyphs than that of Egypt.Later it was felt that there is a need to convey messages in written form then pictographs came into being. The Egyptians thus used a system that combined phonograms, that is, sound-signs that spelt out the word in an alphabetic system, and ideograms, sense-signs that were added to the spelled-out word to depict its meaning, and this language had its own syntax, grammar, and vocabulary. The hieroglyphic writing system consists of signals that represent real objects and these can grouped into three classes. Brunner has described following characteristic of hieroglyphic . Tools: The tools used for writing hieroglyphics were chisels, hammers for stone carving and brushes for colouring and painting, leather and papyrus were the writing surfaces . Hieratic Script : Hieratic is cursive (joint writing) script writing system that was used in the origin of the Pharaohs in Egypt and Nubia. 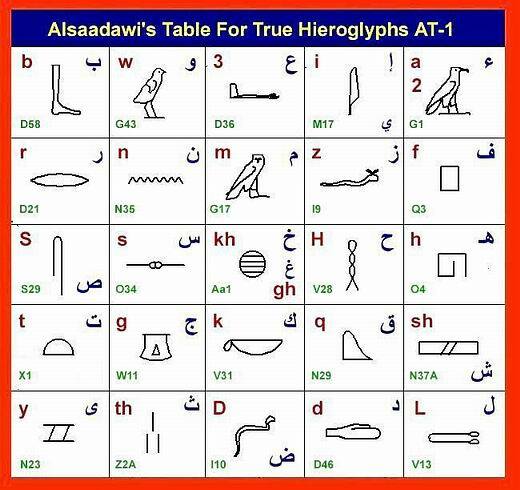 This script writing was closely associated with the hieroglyphic writing because it was developed with the hieroglyphic system and it’s written from right to left orientation .Hieratic script was easy to write about because it was mainly written in ink with a reed brush on papyrus, wood, stone or potter . In the 2nd century, Saint Clement of Alexandria first time used the term derived from Greek phrase γράμματα ἱερατικά (grammata hieratika; literally “priestly writing) because it was used for writing religious scripts (“Hieratic”), .The Edwin Smith papyrus is the world’s oldest surgical document that is written in hieratic script and it describes the explanation, examination, treatment and prognosis of forty-eight types of medical problems in fine detail. Demotic script: Demotic is derived from the Greek work means “popular”, Egyptian called it Demotic script but Clement of Alexandria called it (epistolographikē) “letter writing” and western scholars Thomas Young called it ‘Enchorial Egyptian’. The Rosetta stone is named after the city where it was found .It is a granite slab of 1114.4 centimeters high, 72.3 centimeters wide, and 27.9 centimeters thick. It weighs estimate 1676 pounds. In 1799, General Napoleon Bonaparte was leading his French republican army into Egypt to capture it, accidentally a lieutenant Bouchard discovered a black slab of stone that had been built into the wall. He informed the archaeologists and it became one of the greatest discoveries of 18 century. The Rosetta stone had three horizontal lines with the inscriptions carved in two languages, Egyptian and Greek, with three diverse scripts on each band they were hieroglyphics, demotic script, and koine Greek. The Greek part was already known so it indicated that rest of three inscriptions contained the same message. The inscriptions on the stones were written by saint Memphis summarizing the benefactions given to Ptolemy V Epiphanes (205-180 BC) and were written in the ninth year of his reign in commemoration of his accession to the throne. In 1822 Thomas Young was the first person to explain that hieroglyphs written on the Rosetta stone were the sounds of royal name Ptolemy. In 1822 at 16 years old, Frenchman Jean-Francois Champollion deciphered all the hieroglyphs. He became expert in six oriental languages as well as in Greek, Coptic, and Latin. He explained that the hieroglyphs on the stone were phonetic and had a sound that represents spoken alphabetic signs and syllables; he compared the 1,419 hieroglyphics with Greek text that was less than in 500 words. 5. Goldwasser Oldy , “How the alphabet was born from hieroglyphs”,( Biblical Archaeology Review ,2010). He was fiercely proud of his Jewish faith. He fiercely defended the City of New York, and he fiercely loved its people. Above all, he loved his country, the United States of America, in whose armed forces he served in World War II. This got us thinking about how other historical figures have been posthumously remembered. Here’s a look at some of the stories we unearthed from beyond the grave. The Body of B. Franklin, Printer; like the Cover of an old Book, Its Contents torn out, And stript of its Lettering and Gilding, Lies here, Food for Worms. But the Work shall not be wholly lost; For it will, as he believ’d, appear once more, In a new & more perfect Edition, Corrected and amended By the Author. Murdered by a traitor and a coward whose name is not worthy to appear here. Famed (and doomed) outlaws Bonnie Parker and Clyde Barrow lived, robbed and died together, but despite their wishes were buried in separate Dallas, Texas cemeteries. Bonnie’s grave reflects how she wished to be remembered. As the flowers are all made sweeter by the sunshine and the dew, so this old world is made brighter by the lives of folks like you. More than 300 years later John Keats did not go quietly into the night, but instead offered up this attack against his perceived enemies. 5 months pregnant. 46 years old. Standing all day, two days in a row. 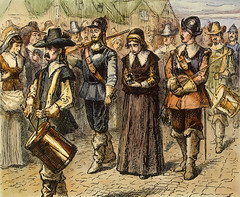 Badgered by the most powerful men in her colony, Puritans of power and assurance, who were threatened by her teaching. No woman could teach, they said. And she must not prophesy. And she certainly must not preach! She should simply—shut up. But Anne Hutchinson didn’t just shut up. 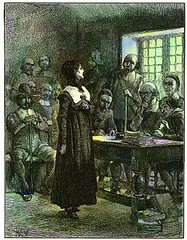 In 1637, she faced down the Dobsons and the Falwells of her day, standing trial for defying the Puritan ministry and government. She held her ground with a remarkable mix of logic, rhetoric, and faith. If you’ve ever gotten discouraged about challenging sexism, theocracy, and fundamentalist power, take a lesson from Anne Hutchinson: never, ever, let them shut you up. Born in 1591 in Lincolnshire, England, Anne was the daughter of a clergyman, Francis Marbury. She was doubtless educated at home, since girls might spend a few years attending school, but they were not allowed at English universities. Even amongst the educated, some subjects were considered quite inappropriate for girls: Latin and Greek, for example. And since many scholarly texts were published only in Latin and Greek, women were shut out of most advanced studies. But Anne may have been different. Judging from her later words, it seems possible that Anne was schooled in some of the more “masculine” studies of her day: rhetoric and theology, perhaps. She was certainly highly literate in English, and had a great grasp of Biblical studies. “Unfeminine” or not, her intellect was no barrier to finding a husband, and in 1612 she married William Hutchinson, also from Lincolnshire but now a successful merchant in London. As their family grew and their business prospered, Anne and William came under the spell of John Cotton, an energetic preacher with opinions labeled “Puritan.” A significant minority in the Church of England, these ardent believers thought that the English (Anglican) Church was not “pure” enough. In other words, although it was Protestant, it was not Protestant enough. According to Puritans, it held too many remnants of the old Catholic order–vestments, ritual, and bishops appointed by the king and enforcing his edicts. They also believed that salvation is pre-determined by God; our actions in life do not “earn” us salvation or damnation. Despite this, each community must work to be pure and follow God’s will collectively, not to earn salvation but to please God. They were deeply concerned with “improving” their communities to be more Godly, with no sports on Sundays, no Maypoles and no Christmas (all pagan, according to the Puritans). They believed if the kingdom did not become more godly, this was a sign of its damnation. Playwright Ben Johnson (one of Shakespeare’s competitors) wrote a “Puritan” character called “Zeale-of-the-Land-Busy,” which gives us a sense of how outsiders viewed this sect: industrious and irritating. Under the reign of Charles I, beginning in 1625, tensions flared between “Puritans” and other Anglican factions. The king encouraged his bishops to enforce doctrinal and ritual conformity. Clergyman who would not abide by the rules would have to step down. Fines for blasphemy and speaking against the royal family were strictly enforced. For those of Puritan belief, it seemed that the entire kingdom was falling into heresy and straying from God’s will–a situation that could only lead to disaster. A small group of Puritans responded by setting up a colony in the New World, Massachusetts Bay, where they could build a Godly community. 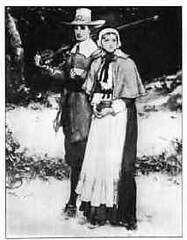 As devout Puritans, it is little surprise that Anne and William Hutchinson decided to undertake the arduous journey to Massachusetts Bay in 1634. Their favorite preacher, John Cotton, had fled their the year before in 1633. Along with ten of their children, they settled into the colony, where both of them enjoyed positions of respect. William was elected a magistrate in 1635, and Anne practiced as a midwife. Midwives were respected female leaders in English communities. They had to be officially licensed as to their good character, and were some of the only women who might be expected to testify in court on a regular basis (on matters of paternity suits or accusations of infanticide, usually), much like the coroner or sheriff might testify. Midwives were just about the only female “public official” in 17th century England. So it’s not surprising that Anne was a leader. She held women’s meetings in her home to explain sermons to her less-well-educated Puritan sisters. She must have been a dynamic and inspiring teacher, for soon the women of the town brought their husbands to hear her words. Anne’s meetings attracted the interest of prominent figures like Sir Henry Vane the Younger, a 22- year-old Puritan aristocrat who would be elected governor of the colony in 1636. As many as 80 people a night crowded into her little home, spilling out into the street; her meetings were sometimes more popular than the sermons they were interpreting. 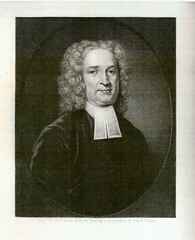 Hutchinson did not hesitate to criticize the ministers of the Bay. She argued that the ministers and leaders of the Bay were becoming excessively focused on “good works,” ignoring the fact that, as Protestants, they believed in salvation though God’s grace alone. 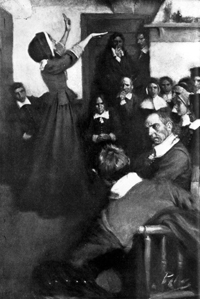 She emphasized the need to commune directly with the Spirit, and suggested that focusing heavily on their sinful natures was leading the Puritan community astray. She denied that children were full of sin, challenging the idea of Original Sin. Trust in God should always be first and foremost, according to Hutchinson, not adherence to laws set up by men (even godly men!). Such words were ill-received by those she singled out. Hutchinson’s timing was unfortunate.The colony had already been rocked by a raging disagreement between minster Roger Williams (who advocated “soul freedom,” or freedom of conscience) and the majority of the theocracy, which demanded proof of salvation before allowing men to participate in civil government. 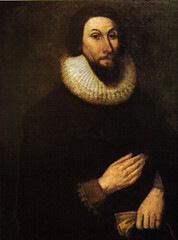 In 1637, Hutchinson’s fan Henry Vane lost the governorship to John Winthrop, first governor of the colony and one of those who opposed Hutchinson’s meetings. Winthrop and his supporters pounced on the chance to silence Hutchinson. Probably motivated by some combination of all three, the colony’s leaders put Hutchinson on trial in 1637. In her mid-forties and pregnant with her 14th (or 15th) child, she stood for two days hours under withering questions and gave clear, cool well-constructed answers that her questioners had trouble deflecting. The clergy denied her entire ability to teach (for women should not teach men, they said), and Hutchinson responded with a spirited and intelligent discussion of women as Biblical prophets. Then she defended her claim to be inspired by God with wit and passion. Enraged by this, the judges sentenced Anne to house arrest. John Cotton backed away form supporting her and his betrayal almost certainly sealed her fate. She was banished and put under house arrest for three months at the home of one of the judges. There she came under almost constant scrutiny and pressure to recant. She withstood it all A second church trial ensued, at which Anne was excommunicated for heresy. She and her family, and several loyal followers, were forced to abandon Massachusetts and set up again in the wilderness of Rhode Island, where Roger Williams welcomed dissenters of all stripes, including those, like Hutchinson, with whom he disagreed. Anne still had no privacy. In the fall of 1638, she had miscarried; somehow her old nemesis John Winthrop was able to get a report on the miscarriage, saying it was a “monstrous birth,” representing her “monstrous” opinions. Hutchinson’s legacy remains debated and complex. She is undeniably inspiring for her intelligence and courage in the face of overwhelming authoritarian oppression. 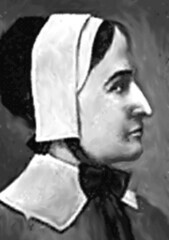 Further, her insistence on being open to the Spirit of God led several of her followers to embrace Quaker beliefs and establish some of the first Quaker congregations in the colonies. In 1987, Massachusetts Governor Michael Dukakis pardoned her, reversing her banishment 350 years before. Her statue now stands before the State House in Boston, affirming her key role as one of our Founding Mothers. 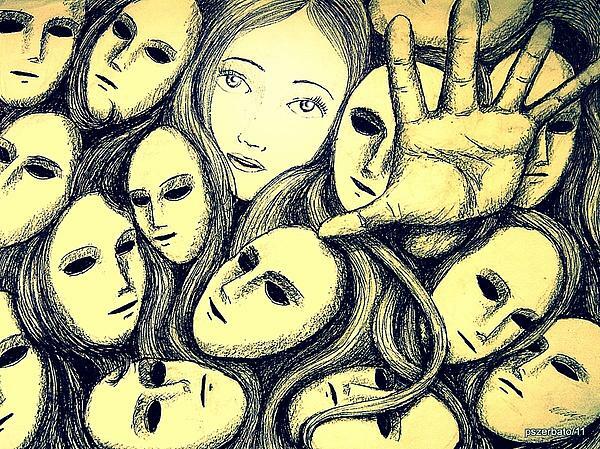 Multiple Personality Disorder (MPD) is defined as a dissociative disorder in which two or more distinct personalities coexist within one and the same individual. It is an example of a neurotic disorder.Multiple Personality is not a form of schizophrenia. The aim of this article was to provide an account of the psychotherapeutic treatment of a 25-year-old woman who was suffering from severe headaches. The patient (referred to as Eve White in the study) had been referred for therapy because of ‘severe and blinding headaches’. At the first interview she also complained of ‘‘blackouts’’ following her headaches, although her family were not aware of anything that would suggest a real loss of consciousness or serious mental confusion. During interviews several emotional difficulties were revealed. The psychiatrists believed that she had a number of complex, but relatively commonplace marital conflicts and personal frustrations. 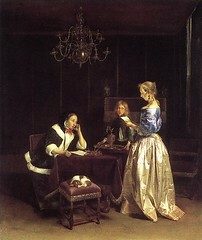 However they were puzzled that Eve White had no memory of a recent trip. The therapists used hypnosis and the amnesia was cleared. Several days after a visit to the therapists, a letter from Eve White appeared at the therapists’ office. The letter concerned her therapy and was written in her usual handwriting, but at the bottom of the page there was a paragraph that looked like a child had written it. On her next visit Eve White denied sending the letter, though she recalled having begun one, which she never finished and thought she had destroyed. During the interview, Eve White who was normally very self-controlled became distressed and asked whether hearing an occasional imaginary voice made her insane. She reported that she had on several occasions over the last few months briefly heard a voice addressing her. During this conversation Eve White, as if in pain suddenly put both hands to her head. After a tense moment of silence her hands dropped, and the therapist observed a ‘quick, reckless smile’ and in a bright voice she said: ‘Hi there, Doc’! To the therapist it seemed that the usually conventional and retiring Eve White had changed into a carefree person. She also seemed to have a very different physical presence in terms of manner, gestures, and eye movements. When asked her name she immediately replied that she was Eve Black. The therapist noted that this new person ‘had a childish daredevil air, an erotically mischievous glance, a face marvellously free from the habitual signs of care, seriousness and underlying distress’. The voice and language structure were also very different, and to the therapist it appeared to be an entirely different woman. Over the next 14 months, during a series of interviews totalling approximately 100 hours, extensive material was obtained about the behaviour and experience of Eve White and Eve Black. The therapists found that although Eve Black could sometimes ‘pop out’ unexpectedly, she could only be ‘called out’ by the therapists when Eve White was under hypnosis. Similarly, after a few hypnotic sessions the therapists could request Eve Black to let them speak to Eve White. After more sessions they found that hypnosis was no longer needed for obtaining the changes. However, the therapists stated that this did complicate Eve White’s life considerably as Eve Black found herself more able to ‘take over’ than before. The therapists believed that Eve Black had enjoyed an independent life since Eve’s early childhood and when she was ‘out’ Eve White was not aware of what was happening. In contrast, when Eve Black was not out she was aware of what was happening. Eve Black told the therapists about a number of incidents in childhood where she engaged in acts of mischief or disobedience, which Eve White was unaware of and was punished for. Some of these incidents were later backed up in interviews with her parents and her husband. According to the therapists, Eve Black’s behaviour was ‘characterised by irresponsibility and a shallowly hedonistic desire for excitement and pleasure’. She succeeded in concealing her identity not only from Eve White, but also from her parents and husband. Eve Black denied marriage to the man, who she despised, and denied any relationship to Eve White’s daughter except that of an unconcerned bystander. To her husband, daughter and parents her unpleasant behaviour, harshness and occasional acts of violence were explained in terms of ‘unaccountable fits of temper in a woman who was habitually gentle and considerate’. During Eve Black’s longer periods ‘out’ she avoided her family and close friends, and sought the company of strangers and she was also able to remain unrecognised when it suited her by imitating Eve White. IQ test results: Eve White obtained an IQ of 110 and Eve Black 104. Rorschach test (ink blot test) and drawings of human figures results: The profile of Eve Black was far healthier than Eve White. Eve Black though was regressive whilst Eve White was repressive showing obsessive-compulsive traits, rigidity and an inability to deal with her hostility. During the therapy sessions it became clear that Eve Black had little compassion for Eve White, and could not be persuaded to help with the therapy. For example, the therapists noted that Eve Black had ‘often misled the therapist into believing she was cooperating, when in fact her behaviour was particularly detrimental to Eve White’s progress’. As Eve White became aware of Eve Black’s existence through the therapy, she became able to prevent her ‘getting out’ on occasions, and so negotiation was necessary for Eve Black to get more time ‘out’. After eight months of treatment Eve White seemed to be making progress. Her ‘blackouts’ had ceased and she was working well at her job (as a telephone operator) and ‘was reaching some acceptable solution to her marital problems’. The therapists believed that another personality had emerged who called herself Jane. The other personality, they argued, was more responsible than Eve Black and more confident and interesting than Eve White. After Jane appeared the three personalities were given electroencephalogram tests (EEG). It was possible to make a clear distinction between the readings of Eve Black and the other two personalities. Although it was not possible make a clear distinction between Eve White and Jane’s EEG. Having been able to work with the three personalities for several months the therapists concluded that if Jane could take possession of the personalities the patient would regain full health and find her way to a happy life. Jane had awareness of both Eves’ thoughts and behaviour but did not have complete access to their memories prior to her appearance. Jane had learnt to take over many of Eve White’s tasks at home and work to help Eve White and showed compassion to Eve White’s daughter. However, although the therapists could work with Jane to determine whether Eve Black had been lying, Jane had not found a way to displace Eve Black, or to communicate through her. It was decided the Jane was the person most likely to bring a solution to the troubled mind, and that her growing dominance over the other personalities to be an appropriate resolution. A postscript to this remarkable story came in the revelation in 1975 by Eve that she had experienced many other personalities before the original therapy and after it. She recalled a total of 22 and suggested that the fragmentation of her personality had been to protect herself from things she could not bear. The therapists, Thigpen and Cleckley do not point to the cause of MPD, the received wisdom is that MPD is usually a response to child abuse – a way for the individual to protect him or herself. Our human heritage is as much in danger today, as it was a thousand years ago. The notion of a shared human heritage is a doctrine of international law. It believes that certain regional areas and cultural elements should be protected from exploitation and destruction. To conserve our ancestry and customs, we have to start thinking of our cultures and precious monuments as part of a united world culture. Through the ages innumerable ancient sites and monuments were destroyed by wars, vandals or natural disasters. Apart from the 7 ancient wonders of the world (of which only the great pyramid is still left), here are ten of the most tragic losses. It is said that the desecration of Baghdad in 1258 by the Mongols ended thegolden era of Islam. In this era, Iraq had developed canal systems that supported its agriculture. Baghdad had a refined culture, was a leading centre of education and was host to various mosques, palaces, hospitals and libraries. As the Mongols conquered and leveled the city, they also destroyed the House of Wisdom and the Grand Library—survivors claimed that the waters of the Tigris turned black from the vast amounts of books flung into it. Thousand were murdered, including the caliph. To this day, its former glory has never been restored. The Parthenon was completed in 438 B.C.. It’s scarred and skeletal remains are the most important surviving remnants of Classical Greece. Through the ages, the temple served as a treasury, Christian church, mosque and a munitions dump. It was home to grandiose carvings, sculptures and decorative stonework—most notably the chryselephantine sculpture of Athena created by the famous sculptor Phidias, now lost and only known from descriptions, gems, coins and paintings. It was damaged beyond repair in 1687 when the munitions were ignited during a Venetian assault. During the 18th century, the ruins were desecrated even further when the remains of the sculptures and friezes were severed from the walls. Memphis was the Capital of Ancient Egypt for several centuries. It was also the seat of the cult of the god Ptah. During its golden age, Memphis was the primary royal residence and sources speak of immense palaces that were built underneath important royal pyramids. Invaded by the Hyksos in 1650 B.C., the astounding monuments, temples, palaces and statues were destroyed and looted. The city gradually became a quarry for new settlements being built in the area. Even the foundations of Cairo were laid with stones from the destroyed temples. Today, apart from its ruins, almost nothing remains of ancient Memphis. The First Temple or Holy Temple was dedicated to the God of Israel and is believed to have been built by King Solomon in 832 B.C. on the Temple Mount. It was the first fixed temple structure of the Jewish people as previously tents or tabernacles were used. It harbored the Ark of the Covenant that contained the two tablets Moses received from the Lord, as well as numerous sacred vessels and sculptures. Certain parts of the temple were even plated and glazed with gold. Though limited proof has been found to verify the temple’s existence, the sensitive religious and political nature of the area makes archaeological excavations impossible. Its destruction is one of the most tragic events in Jewish history. The Imperial Gardens, built in the 18th century, was the residence of the emperors of the Qing Dynasty. (The Forbidden City played host to formal ceremonies.) It was a combination of palaces, halls, pavilions, lakes and gardens that covered 860 acres, roughly 8 times the size of the Vatican City. It had one of the largest and most exquisite art collections in the world that included unique copies of manuscripts and compositions. It was destroyed in 1860 by British and French troops after two British envoys were murdered. Of the surviving relics most remain in private collections despite the Chinese government’s efforts to retrieve them. Constantinople was the biggest and most prosperous capital in the Eastern Roman Empire. The Imperial Library was the last of the great libraries. It conserved ancient Greek and Roman manuscripts and also had a Scriptorium to duplicate the ancient texts in a time when uncertainty and chaos brought about their mass destruction in Africa and Europe. In fact, most of the Greek classics known today are copies that came from the Imperial Library. The greater part of the library was destroyed during the 4th Crusade in 1204 with the last vestiges completely lost after the Ottomans captured Constantinople in 1453. Some manuscripts were said to have survived into the Ottoman era but none has ever been found. Timbuktu lies 620 miles northeast of Bamako. Its cultural treasures made it a hotspot for venturesome tourists and international academics. Home to priceless artifacts, thousands of ancient manuscripts and sacred tombs it is believed by many to be the academic and religious center of Africa. In April 2012 Timbuktu was captured by Islamist militants. In what has been called an “offense against the whole of Africa” the following months saw the destruction of several ancient tombs of Sufi saints because it “contravened Islam”. As Timbuktu was liberated by French and Malian forces, the militantsfurther outraged the international community by setting fire to the Ahmed Baba Institute, burning thousands of ancient manuscripts. Aristotle is one of the most influential people to have ever walked this earth. He contributed to nearly every area of human understanding and pioneered several new fields of study. His writings and dialogues (of which the majority are believed to be lost) covered a vast area of subjects. The remaining texts mostly consist of working drafts or notes that were used in Aristotle’s school. It is believed that the writings ended up in a cellar a few generations after his death where they were severely damaged. Rediscovered in the 1st century B.C., numerous errors were introduced into the writings when Apellicon of Teos tried to restore them. Tenochtitlan was the capital of the Mexica Empire. Located on an island on Lake Texcoco, it was the largest city in the New World. In comparison to Europe, only Constantinople, Venice and Paris were larger. It was connected to the mainland by causeways obstructed by bridges that could be retracted if the city came under attack. It was home to the palace of Montezuma, the Templo Mayor temple complex, zoos, an aquarium and botanical gardens. The glorious city was destroyed by the Spanish conquistador Cortés in 1519. The city was destroyed and its palace and temple dismantled whereupon the Spanish constructed a cathedral and colonial city on top of it. Created in the 4th century A.D., the Bamyan Buddhas were the largest standing Buddha carvings in existence. Placed at a crucial waypoint next to the fabled Silk trading route, these cultural landmarks were a testimony to the exchanging of Indian, Roman, Hellenistic and Islamic ideas for hundreds of years. They were also important figures in the accession of Mahayana Buddhist tutelage, which accentuated the capacity of each and every person to obtain enlightenment. In March 2001, the Taliban regime declared the statues to be “against Islam” and had them demolished with anti-aircraft munitions and dynamite. The methodical eradication of Afghanistan’s Buddhist inheritance has been criticized internationally. Stonehenge is the UK’s most important ancient monument and has been throughout history. It’s one of Britain’s most important tourist destinations and attracts about 900,000 visitors every year. It was visited by Romans stationed in the region and a Saxon burial on the site confirms that it was seen as a place of religious significance during both the dark and middle ages. The earliest known written reference appears in 937 AD with regard to a land deed from King Athelstan to Wilton Abbey which refers to ‘Stanheyeg’. It’s near impossible to imagine how Neolithic people managed to build it and rearrange it several times over the millennia. It’s important to pagans and druids as a religious site and is at the centre of the British crop-circle phenomenon. Some archaeologists believe it was a temple while others believe that it represented a doorway into the afterlife. Stonehenge is at the heart of an ancient stone-age complex that is far larger than the monument that can still be seen today. The strange and weirdly beautiful terraced pools of Pamukkale have been appreciated for over two millennia and yet still remain a little known wonder of the world. Thousands of years ago earthquakes, which are common in Turkey, created fractures that allowed powerful hot springs to bring water rich in calcium carbonate to the surface. As the water evaporated the chalky material condensed and formed layer-upon-layer of Travertine and thus slowly built up the walls over time in the same way that a stalactite forms in a cave. Apparently Pammakale means Castle of Cotton but the Greco-Romans built a town above it called Heirapolis – meaning “Holy City” or “Sacred City”. They too recognised it as a rare and important place attributing healing powers to the milky-white waters.Pamukkale is now a UNESCO World Heritage Site and to save them from further damage, the pools have been closed to the tourists that once bathed in their waters. These large, spherical, alien and strangely beautiful boulders are mainly located on Koekohe Beach, part of the Otago coast of New Zealand’s South Island. Known as “Moeraki Boulders” they were originally formed on the sea floor from sedimentary deposits that accreted around a core in the same way that a pearl will form around a particle of sand. The erosion of the cliffs often reveals these boulders from the surrounding mudstone allowing them to join those already on the beach. Some of the larger boulders weigh several tonnes and can be up to three metres wide.Maori legend attributes their origin to the arrival of the first ancestors / giants who came in the great Araiteuru canoe which was sunk by three great waves at nearby Matakaea. It is said by the Maoris that some of the surviving crew of the Araiteuru canoe were turned into stone and became mountains. The Moeraki boulders are said to be the pots and chattels from the canoe. Beppu, located on the Japanese island of Kyūshū, is the second largest producer of geothermal water in the world. Located in the same area are the “Nine Hells” or ponds that each has its own remarkable character and colour thanks to the variety of minerals in the outflows. These “Hells” are a popular tourist attraction in Japan but are little known outside of the country. Seven of the strange geothermal springs are located in the Kannawa area and are known as: Sea or Ocean Hell (Umi Jigoku), Shaven Head Hell (Oniishibozu Jigoku), Cooking Pot Hell (Kamado Jigoku), Mountain Hell (Yama Jigoku), Devil or Monster Mountain Hell (Oniyama Jigoku,) Golden Dragon Hell (Kinryu Jigoku) and White Pond Hell (Shiraike Jigoku).Further away in the Shibaseki District are Blood – Pond Hell (Chinoike Jigoku) – right – and Waterspout Hell (Tatsumaki Jigoku). At the summit of Mount Teide, one of the largest Island volcanoes in the World is the Las Cañadas caldera. The crater, which is an enourmous sixteen kilometres across, is a picture of what Hell might look like if it cooled a little. Sheer walls that formed when the caldera first collapsed encircle this dry and alien place. And, with an arrogance than can only be accepted as typical, humanity has built roads and observatories across this no mans land that is little more than a plug over a sleeping yet still active and very large volcano. When we visited it some years ago we were standing in the viewing gallery when the ground beneath our feet trembled and several windows suddenly cracked. The sleeping giant was grumbling in its sleep. The land mass created by the volcano is Tenerife in the Canary Islands. Las Cañadas caldera, Mount Teide. Not dead just sleeping! The UN Committee for Disaster Mitigation has listed Teide for close observation due to its history of powerful eruptions and its location near several large towns. Found on both land and in the ocean throughout the Bahamas and the national waters of Belize are deep circular cavities known as Blue Holes which are often the entrances to cave networks, some of them up to 14 kilometres in length. Divers have reported a vast number of aquatic creatures some of which are still new to science. In addition, they’ve recorded chambers filled with stalactites and stalagmites which only form in dry caves. For the explorers this was proof that at one time, nearly 65,000 years ago, when the world was in the grip of the last major ice age, the sea level of the Bahamas was up to 150 metres lower than it is today. Over time the limestone of the islands was eroded by water and vast cave networks created. When sea levels rose again about 10,000 years ago some of these collapsed inwards and the Blue Holes were formed.The Great Blue Hole is located in the Light House Reef aproximately halfway between Long Caye and Sandbore Caye. It is about 60 miles east from the mainland of Belize (city). In 1997 it was designated as a World Heritage site. Located in the Kara-Kum desert of Turkmenistan is the village of Darvaza (Derweze) near to where, in 1971, a team of Soviet prospectors allegedly drilled into a large chamber filled with natural gas. The roof of the cavern collapsed leaving a crater-like sinkhole some 25 metres deep with a diameter of approximately 60 – 70 metres. It soon became evident that natural gas was still rising into the crater from even deeper sources and the story goes that the decision was made to ignite the emissions rather than risk either a concentrated build-up of gas or local poisoning. According to various sources it has burned continuously since then and has apparently been named “The Gate to Hell” by the local people. However, another source that spoke with the guides from the region claims that it is a wholly natural phenomenon. It is most impressive at night and the glow from its flames can be seen miles away. The inside of the crater is black from carbon build up and the heat is so intense that it is only possible to stay near the edge for a few minutes. Sanqingshan is a relatively small National Park near the city of Shangrao in the Jiangxi province of China. What it lacks in size it makes up for in shear natural beauty. It is officially the 7th World Heritage Site designated in China and has been noted for its exceptional scenic attraction. The key mystique of this remarkable place is the combination of extraordinary granite geology in the form of weird outcrops and pillars combined with seasonal climate variations than often cause mists, fogs and striking sunsets. Those that have visited this place describe a feeling of overwhelming peace and tranquility. This effect is enhanced by the profusion of natural waterfalls, pools and springs. If you allow yourself, it is truly possible to see Earth, Water, Wind and Fire joined in time.A story that is told is that Mu-Go the “Lord of the East” wished to create a garden for the amusement of his consort “Yin” and persuaded the four elements to fuse together and create Sanqingshan as a private garden for her amusement. From space this mysterious depression in the Sahara Desert of Mauritania really does look like a human eye. The image to the left is the “pupil” but a visit to Google Earth zoomed out a little will reveal the cliffs that make up the rest of the eye. This natural phenomenon is actually a richat structure caused by the dome shaped symmetrical uplifting of underlying geology now made visible by millennia of erosion. Please note that this explanation is not wholly accepted by the scientific community. There still remain academics that believe it is the sight of a meteor impact and yet others still that believe it resembles the formations caused by underground nuclear blasts. By the way, we estimate that the detonation would have had to be in the gigaton range. Currently no country in the world has a weapon even close to this destructive yield. Currently scientists believe that they know what caused this formation. Hey! It’s a Ri chat structure … whatever that really means. A more Bizarre theory is that it is the impact site of an ancient but very powerful bomb. Located in one of the flattest places on the face of this planet are the strange and unexplained Sailing Stones of Racetrack Playa – Death Valley – California – USA. Once a year the “Playa” or flat desert pan experiences short winter rains and becomes slippery as the hexagonal desert floor turns back to mud. During this time the boulders and rocks move leaving clearly visible tracks behind them. Although scientists believe that high winds are responsible, some of the rocks will suddenly change directions and move at almost perfect right angles to their previous direction. All the evidence suggests that this is not a hoax although it is also said that the movement of these rocks has never been captured on film or video. In this technological age we wonder why time lapse photography hasn’t been used?The Sailing Stones add mystique to Death Valley but the real strangeness of this place is its desperate isolation, heat and incredible flatness.